Research by Continental Tyres shows that as many as one in four truck tyres may be running under-inflated by 10%. This not only leads to significantly higher fuel costs but contributes to the likelihood of tyre failure, which is currently responsible for 20% of all truck breakdowns. 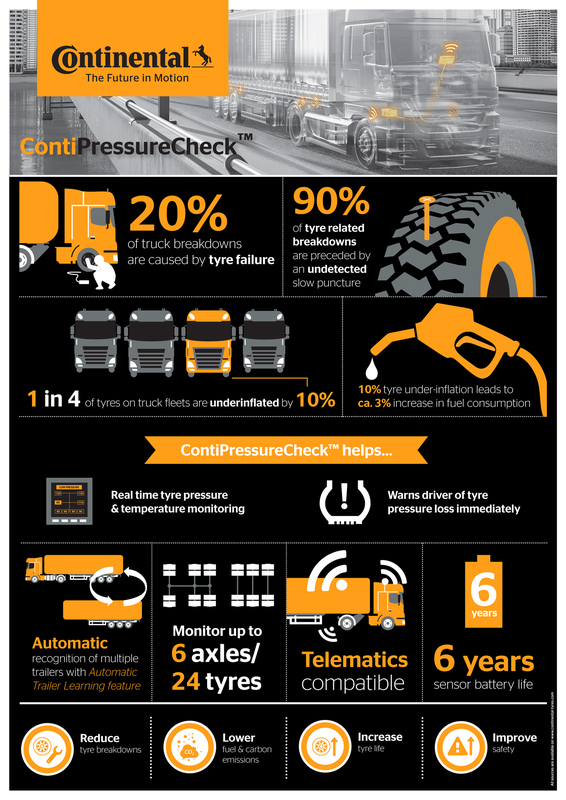 As part of Continental’s strategy to provide customers with safe, reliable and efficient solutions for their transport needs, Ian Jackson, from Continental Tyres discusses how the correct application of a tyre pressure monitoring system (TPMS) such as ContiPressureCheck can positively impact business. Ian Jackson, is Technical Systems, Sales & Services Manager for Continental Tyre Group and is responsible for the business development of ContiPressureCheck in the UK & Ireland. Ian has 34 years’ experience in the tyre industry, starting his career as a tyre fitter and mechanic before becoming area sales manager for a large independent tyre company. Q What are the benefits to customers of using a TPMS? Safety is of course the primary benefit as the system will pre-warn the driver of any temperature or inflation issues. Larger commercial vehicles obviously have quite a distance between where the driver is sitting and the tyres themselves, so it is important for them to be aware of the condition of their tyres. The Continental TPMS – ContiPressureCheck - provides live pressure data and additional warnings at the point where there has been both a 10% and then 20% reduction in air pressure inside the tyre, notifying the driver of a problem. ContiPressureCheck allows for the safe resolution of a potential tyre incident, allowing the driver to stop at a service station or off the road before the situation becomes critical. In addition to inflation pressure, ContiPressureCheck also constantly measures temperature. Should spikes in temperature occur, which when investigated cannot be attributed to the tyres, this flags potential mechanical issues such as binding brake or wheel bearing failures, which are costly and dangerous problems if left untreated. As tyre inflation pressure directly contributes to the vehicle’s overall fuel efficiency, providing the ability to constantly monitor this offers the operator the opportunity to reduce their fuel costs. Q What are the benefits of using the ContiPressureCheck system specifically? The main benefit with ContiPressureCheck is that it is constantly transmitting live data, continually pre-empting any potential issues in real time. Additionally, the ContiPressureCheck sensor is attached to the inside the tyre itself, which improves measurement accuracy. Devices which are strapped to a metal wheel rim will be more susceptible to heat transfer during braking, making it difficult to monitor the temperature effectively. Other systems where sensors are attached to the valves, have the issue that the primary air seal is removed and instead rely entirely on the O-ring. A unique benefit of the Continental system is the partnership between the company’s tyre and automotive systems divisions. Our ContiPressureCheck system has been specifically designed from a tyre manufacturer’s point of view. We understand how a tyre behaves and what factors routinely effect its performance, so we built a TPMS with those in mind. Q Is there a particular kind of fleet business that would most benefit from ContiPressureCheck fitment? I genuinely believe all fleets could benefit which is why we have tailored the system to allow for different applications. For example, an operator running vehicles locally from a depot may wish to install a ContiYardReader which checks the vehicle every time it passes a certain point, or during refueling, depending on where the system is installed. However, a long distance truck operator may prefer to have live data streamed to the driver, to ensure real time assessment of the tyres condition when away from base. But what is worth bearing in mind is that it doesn’t need to be complicated. ContiPressureCheck ‘Light’ is an entry level system which simply uses the sensors in the tyres and an easy-to-use hand held device. With this ‘Light’ version, a quick walk round check can be completed once a week – which is enough for some users. This will enable an accurate pressure & temperature report to be generated for the whole fleet extremely quickly. Q Should fleet managers look to install ContiPressureCheck across their whole fleet? Absolutely – our integration with telematics systems would allow fleet managers to access live data from all their vehicles, which not only helps report potential problems, but generates reports to ensure optimal tyre policy going forward. In addition, software such as our Automatic Trailer Learning (ATL) means that truck and trailers can be switched as and when necessary and the system will automatically connect them. This not only involves minimal disruption, but also means that if a trailer has not been utilised for a while ContiPressureCheck will run a complete check on all the new tyres it registers. Q What feedback have you had from drivers using ContiPressureCheck? It has been very positive, to the point where we have some customers tell us that drivers prefer vehicles with ContiPressureCheck fitted. One of our ongoing customer initiatives is to provide practical advice and training tools to ensure drivers and fitters are fully up to speed on the system. We find when this is done, that the benefits speak for themselves. Q Where can customers purchase the ContiPressureChecksystem? Customers can purchase the system through a direct account relationship with Continental, through an approved ContiPressureCheck dealer or with guidance from our Conti360° network partners. Q Would you recommend customers run trials of ContiPressureCheck? Yes, because one size doesn’t fit all. There are lots of different ways to use ContiPressureCheck. We find some customers for example prefer to start with ContiPressureCheck Light and then move on to see the benefits of the live data options with the full system. We work closely with customers throughout the period of the trial to ensure the system is adapted to suit the specific requirements of their business without being unnecessarily complicated. Q Is the ContiPressureChecksystem expensive to install? The cost is around two-to-three hours labour. As many fleets have their own engineers (service facility), Continental can provide the initial installation training and then offer back up support if and when needed. Alternatively, Continental have fitting agents who are both mobile and strategically situated around the UK & Ireland. Q What maintenance does ContiPressureCheckrequire once installed? Absolutely no maintenance is required. If a wheel changes position, the system simply needs to be reconfigured via the hand held device. Q Can any tyre fitter install a ContiPressureChecksystem? Yes, with proper training and a thorough understanding of commercial vehicle electronics. Q How long will a ContiPressureCheck system last? Q What happens to the ContiPressureChecksensor when a tyre is changed? The sensor comes in a rubber housing which is mounted inside the tyre. When the tyre needs replacing, the sensor is simply removed and fitted into a new housing and placed into the new tyre to continue its service life. If a new sensor is required and fitted, the system will evaluate all the sensors and by default, recognise and accept the new addition. If two or more new sensors need replacing at the same time, there is a need to reconfigure the system using the hand held device. Q Do you think it would be beneficial for TPMS to become mandatory on commercial vehicles? Without a doubt it would make the roads a far safer place. TPMS is essential to identify any potential inflation or temperature problems before they occur. Many commercial vehicle fires in the UK are as a direct result of mechanical faults such as binding brakes, so live temperature readings to alert the driver to the problem would make a huge difference. Similarly with rear wheels 6-metres back from the driver, there is little chance of being able to gauge whether there is an inflation issue or a puncture in the tyre. With adequate warning, drivers can safely pull in for repairs at a service station or safe site rather than trying to fix a problem on the side of the road, which is in itself dangerous. Q What technological advances can we expect from ContiPressureCheck in the future? Telematics integration on a bigger scale is a priority for us and we’re working with a number of telematics companies through our customers. And the integration of tyre wear information is something we are looking at for the next phase.